Truly a special specimen in guitar craftsmanship, the Alvarez DYM60HD is part of the Yairi Masterworks Honduran series, some of the finest instruments to come out of the shop! 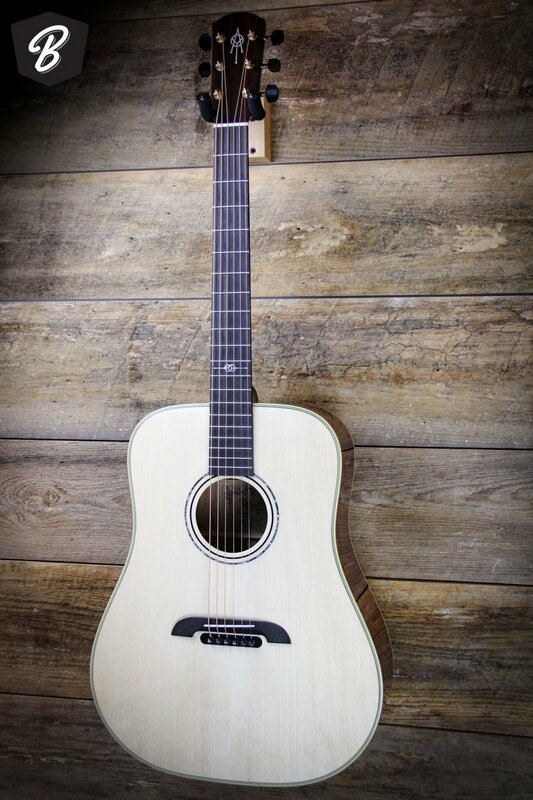 Expertly crafted with an AAAA Adirondack Spruce top and ultra rare Honduras Mahogany back and sides that have been naturally seasoned for nearly 50 years, the DYM60HD acoustic is an absolute acoustic marvel. This guitar gives enthusiasts a peak behind the curtain of Kaz Yairi's stash of some of the world's most desirable tonewoods, which has been shrouded in mystery for years, and has become almost mythical among acoustic guitar aficionados. The Alvarez-Yairi Masterworks instruments represent the ultimate crossroads of old-world traditional craftsmanship and modern construction techniques. After 50 years of refinement, the Yairi luthiers have constructed a guitar that embodies the magic so many players seek and yet few have yet to find: the delicate balance of roaring power and subtle, shimmering detail. The connection you'll have with these instruments can only be described as telepathic. Every input, no matter how dynamic, practically leaps out of the guitar like an arc of electricity. The experience will change your perspective on what an acoustic instrument should be. The luthiers in the Yairi shop have learned a few things in 50 years - most importantly, the magic is nothing if you can't replicate it consistently, guitar after guitar. Part of that equation is a maniacal attention to detail. Another component is the use of modern construction techniques unique to Yairi instruments. If you're going to redefine the idea of balanced tone, you've got to experiment. The Yairi luthiers started by building dozens of prototypes, each using a different bracing pattern. Through almost two years of testing, they gradually narrowed the field until they had settled on what everyone believed to be the most responsive, loudest, best-sounding guitar they had ever built. The bracing technique used in that guitar is now known as ‘FSTII,’ short for ‘forward-shifted, type 2.’ This unique bracing pattern is now found in all Yairi Masterworks instruments, and is at the core of their vibrant, explosive tone. Part of what makes Yairi instruments so responsive is the direct-coupled bridge. Under the top, there is an ebony block with a flange that pulls the bridge plate and top. When inserted into the bridge, the strings pull up on this block, which couples the strings directly to the bridge plate and top. Simultaneously, the strings exert down-pressure on the saddle and bridge, ensuring that it cannot be pulled off the guitar. The complete system could literally function without any glue, since the string tension pulls the block tight to the top while also holding down the bridge, increasing sustain, volume, and resonance while creating extremely clear articulation between the strings. Yairi instruments also use an extended dovetail neck block. This adds support to the area between the body joint and the end of the fingerboard. Combined with a longer adjustable truss rod, this results in a significant increase in stability all the way to the sound hole. This in turn has a dramatic impact on tonal balance, and gives these instruments their immediate, punch-in-the-chest response when you really rip into them. This perfect collision of innovation and tradition is what Yairis are made of. Uniquely expressive instruments that'll give you the chills every time you pick them up, now and forever.